2.5 stars. If this series was longer than a trilogy, this would probably be where I'd throw in the towel. Since there's only one book left and I know a conclusion is coming (one that has the potential to be exciting), I'll go ahead and finish it out to see how everything ends.Crossed is not a bad book. Quite the opposite. There is a big portion of the GR population who are fans of Condie's writing style, and for good reason. The author has a poetic way of describing her story world. She adds beautiful references into her books about the art and writings of our past. I completely understand why some people devour every word, every line of these books. Unfortunately, I'm not one of them. I'm not sure why some descriptive books click with me (such as Daughter of Smoke and Bone by Laini Taylor, which I inhaled with a passion), while others don't. I had a similar problem with Westerfield's Uglies series. The concept sounded incredible (reminding me of one of my favorite old Twilight Zone episodes), but his writing style felt dry to me. Yet, many others enthusiastically rave about his books. Which is fine. They're probably clued into genius, and I'm not getting it!This second installment in the Matched series was not a complete loss for me. The last 75 or so pages had me on the hook, yet again, much like how book 1 ended. A few theories started popping up in my head of what was to come in the next book. I started questioning Cassia's motives for wanting to be with Ky, even though she's convinced herself she could never love anyone like him. I do like that there are questions aplenty swirling in my head. Who knows? Maybe the last book is going to bring it big time. 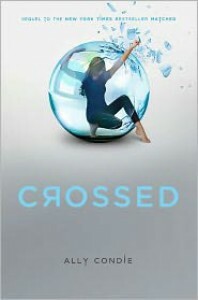 There's a lot that could happen.Who will stay in The Rising?Who will live through the (presumed) upcoming rebellion?How will Cassia react to Xander's secret?What is Indie's role in all of this?What life (and who) will Cassia choose?I may not have been very enthused about Crossed, but I am excited to see what's up next.